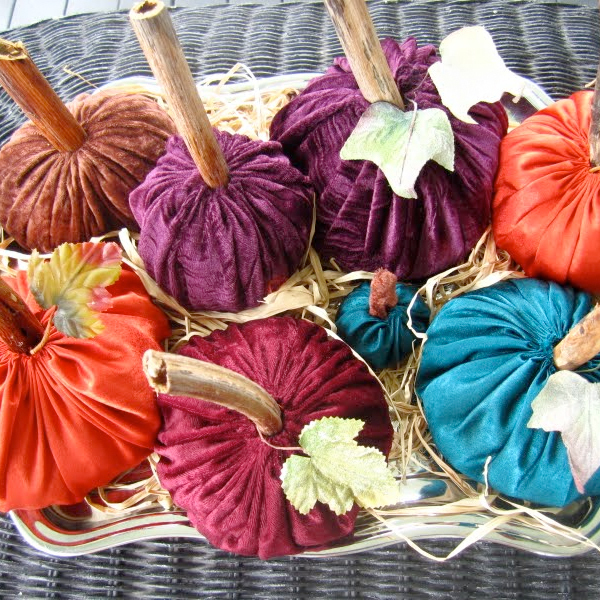 I came across a picture on the net somewhere of velvet pumpkins and I instantly thought of my mom. She's always had a knack for creating really pretty seasonal displays and if I had to choose a fabric to best describe her, it would be velvet, hands down. Perfect opportunity for a... Create- A- Date! We went down to Fabric Land to pick up some velvet. Too expensive! So we went with some variations: stretch velvet, some silky stuff that looked like velvet and cotton velvet. Verdict: They all looked good, but the least amount of stretch and the thinner fabrics had the better results. Step 1: Trace a circle using your bowl. Step 4: Pull both ends of your thread to gather the fabric into a little sack leaving two long tails. Step 6: Once it's fully filled, carefully remove the funnel and pull both ends of thread to close the opening and tie it in a knot. You'll have a small opening at the top for your stem to fit into or glue over. Step 7: Glue your stem on top with a hot glue gun, or carefully insert it in the opening. If you have your stem stuck in the opening, be careful not to tip it over. It's best just to glue it on top but since I didn't have enough pumpkin stems, I wanted to be able to leave them unglued so I can replace my sticks and roots with pumpkin stems as they become available. I think they look pretty awesome! 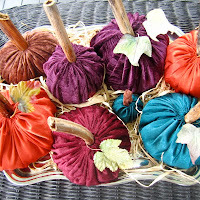 So there you have it... a craft for the fall season!